Ann’s running out of time - Wylie Communications, Inc.
Have you been thinking about bringing me in for a writing workshop early next year? TIME CRUNCH Ann's fully booked for 2011 workshops and already booking 2012 engagements. If you're looking for a writing workshop, call Ann now. If so, let’s act fast. As a result, my first quarter 2012 is already filling up. As I desperately want to work with you next year, please contact me today if you’re looking for a writing workshop in the first few months of the year. You don’t need to worry about whether I fly first class or no-class, take a limo or the bus, sleep at the Ritz or in my car, dine on caviar and champagne or chomp on Cheetos and Diet Coke. I don’t have to collect, collate, scan and send receipts. You don’t have to do battle with the bean counters to get my invoice paid; I don’t have to stand by for my check while you fight with accounting. You know exactly what your expenses will be well in advance; I know I don’t have to hassle with paperwork. No surprises: No expenses. No kidding. 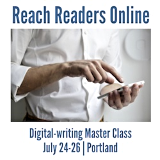 Please let me know how I can help your team members Think Like a Reader, Cut Through the Clutter, Write for the Web and otherwise get the word out in 2012. The corporate communication writer’s corollary: If you cover your terribly serious and important stories, and nobody pays attention, does your message still make a sound? 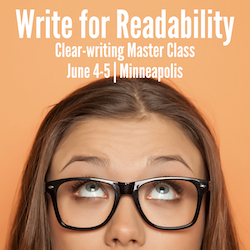 In this creative-writing workshop, you’ll learn how to write copy that grabs attention, keeps it longer, communicates more clearly, enhances credibility and is more likely to go viral. You’ll walk away with techniques — not just what to do, but how — for painting pictures in your audience members’ minds so they understand your points faster, enjoy your information more and remember it longer. Grab Attention With Feature Stories: Craft creative leads and kickers. Make Your Copy More Colorful: Engage readers with fun facts, juicy details. Play With Your Words: Spice up your headlines, leads and sound bites with wordplay. Master the Art of the Storyteller: Tap ‘the most powerful form of human communication’. Add Meaning With Metaphor: Clarify complex concepts with analogy. Edit, write, repeat: Bring your laptop and a story to work on, write and rewrite, get and give feedback, and leave with a totally rewritten piece. Learn more about the Master Class. Browse all upcoming Master Classes. Would you like to hold an in-house Make Your Copy More Creative workshop? Contact Ann directly.